Complete your child's playroom with this generously sized Child’s Square Table. 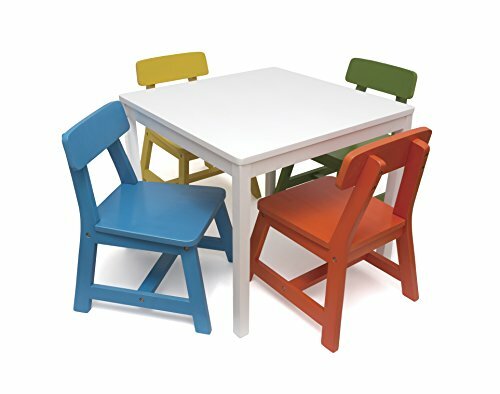 It comes with 4 chairs that fit with any decor and are perfect for little ones to use for schoolwork or playtime. Wipe with slightly damp cloth. Do not soak. Do not use soap. Dry immediately with cloth or towel. Do not allow to air dry. Product will warp if it is not dried immediately. Lipper International provides exceptionally valued items for the kitchen, home, office, and child's playroom. Beautifully finished and incredibly sturdy, the Kids Collection from Lipper International is perfect for any child. Add a new dimension of fun and functionality for your children within any room of your home. Having sturdy design and rugged durability, our tables, desks, chairs, and toy chests provide children of all ages with colorful items well suited for play and creativity. The wide assortment of color and design of our Kids Collection will match any child's room and exceed expectations. Dimensions: Table (W x D x H): 23 1/2" x 23 1/2" x 21 1/4"; Chair (W x D x H): 11 1/2" x 12 1/2" x 20 1/2" (each); Chair floor to seat: 11"
If you have any questions about this product by Lipper International, contact us by completing and submitting the form below. If you are looking for a specif part number, please include it with your message.